You can also use right click to copy/cut and paste events. In the Events Editor you can design how a scene works. Events are presented in a list, with conditions on the left and actions on the right. In addition to standard events using conditions and actions, other event types can be added: For example, with comment events you can add some text in the event list. Finally, you can add sub-events, which are executed only if the parent conditions are fulfilled. While events are repeated while their specified conditions are true. To add an event, click on Add an event in the ribbon. You can also hover with the mouse on an already existing event and choose Add an event in the resulting panel. You can add and edit other type of events and sub-events in the same way, either by using the ribbon or the panel appearing the event (in the latter case, choose Other). You can move an event up or down by dragging it with the mouse. To add an action or a condition in a list, hover on the list with the mouse and choose Add an action/condition from the panel appearing below. Actions and conditions can be moved and deleted in the same way as events. 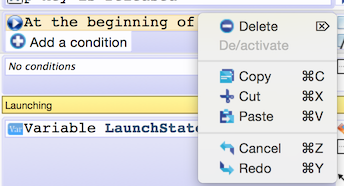 Make a double click to edit a condition or an action. The Event Store allow you to browse and customize events made by others users: in a few click, you can quickly prototype your game and structure your events into large blocks dedicated to a single task. Events available in the Event Store are the events shared on GDevApp.com, the online game creator based on GDevelop. The ribbon provides access to other features such as Undo, Redo and Search and Replace operations. Conditions and actions are listed in two separate columns. You can resize these columns by dragging the column separator.